Collections, Liens and Foreclosures - What's the Right Decision? So what happens when owners fail to pay their assessments and a late notice isn't working? Associations rely largely—many exclusively—on homeowner assessments to pay their bills, which can include landscaping, garbage pickup, pools, street lighting and insurance. For condominiums and cooperatives, these costs include building maintenance, utilities and amenities enjoyed by all residents. You are entrusted as the board to develop realistic annual budgets. We base our assumptions on careful cost projections and anticipated income primarily from assessments. Our budgetary obligations do not change when some owners don’t pay their fair share. Common grounds still must be maintained. Garbage must be collected. Utilities and insurance premiums must be paid. When homeowners are delinquent, their neighbors must make up the difference or services and amenities must be curtailed. The former is an issue of fairness; the latter can lessen the appeal of the community and erode property values. So what do we do next? When an owner fails to respond to repeated attempts to collect the debt, the association can be left with little choice but to place take additional actions by referring the account to a collection agency. The magnitude of this decision requires an approach that is fair, reasonable and consistent and that complies with applicable laws, practices and procedures set forth in the governing documents that guide our decision-making. We believe homeowners facing collection activity deserve a reasonable opportunity to appeal to the leaders of the association. Knowing that people occasionally face financial hardship—a lost job, for instance—we will try to work with homeowners to bring their accounts up to date. When that fails, the collection agency is a usually the next step. 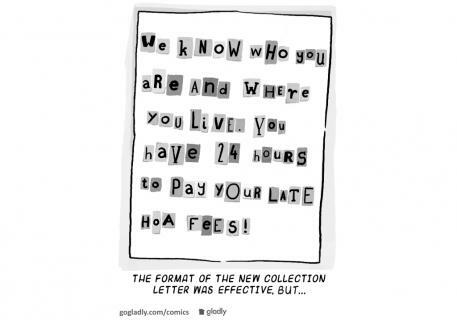 Why a collection agency and not an attorney first? Attorneys are expensive and their fees add up quick for both the association and the owners. Collection agencies offer collection services at a fraction of the cost of attorney fees. This helps the owner get caught up faster. It also gives affordable collection services for smaller associations that can't afford large legal bills. The collection agency is also often a faster and more effective way to encourage owners to pay their outstanding dues or enter into a payment plan. Having their credit hit with a delinquent account has an immediate impact on their ability to finance vehicles, credit card and loan rates and more. This can be more of an incentive than a lien on their home that they have no intent on selling or refinancing any time soon. Sometimes the collection agency doesn't work and we need to consider stronger alternatives and employ the collection efforts of the association attorney. Nobody wants to foreclose on a home—not a mortgage banker and certainly not our association. However, the threat of foreclosure is often the only tangible leverage an association has to ensure fairness and shared responsibility. Without this option, many residents would simply choose to default on their obligation to their association and neighbors. How many Americans would pay their taxes if government had no means of enforcement? Placing a lien on property, with the ability to foreclose, is typically enough to get delinquent residents to meet their financial obligations to the community—without removing the owner from his or her home. When that fails, associations turn to the final—and unfortunate—option of foreclosure. We want you to know that we understand the magnitude of this decision and why it may occasionally be necessary. Above all else, association leaders are responsible for sustaining the financial viability and stability of the association. As noted earlier, our budgetary obligations do not change when assessments aren’t paid. Services residents expect must be provided; the community must be maintained; bills must be paid; and our investments and property values must be protected. Prior to taking these next steps we need to carefully consider options at our board meeting. Texas Property Code laws will also come in to play, along with the association documents to guide our next steps. Questions about liens and the foreclosure process are some of the most common questions we receive from board members. And with good reason! Texas property code is changing every year and its important that we are complying with laws that govern associations. Our summer board member education class will be held in August 13, 2018 at 6:00p.m. at the John Igo Library with attorney Tom Newton. Tom will be there to educate us on current laws regarding HOA collections. He will also answer your questions. Light snacks will be provided. The topic and content of this class is prepared for a board member audience but residents are invited to attend as well. In addition - you don't have to be a Hill Country Homeowner to attend. Everyone is welcome! Please use our new RSVP page so we can plan for seating and snacks. Sounds great, but how about an address and time.